Replica item ~ perfect for any coffee or side table. Applicable for: 1:12 dollhouse. Sixbook blocks ( L x W x H) :Approx. Keep it dry and cool, avoid sunning. Carefully reproduced & digitally enhanced by CDHM artisan. excellent miniature valentines cards set. photo shows miniature cards displayed on a 1/12 fireplace (not included). These cards will look wonderful in your miniature scene or alternatively may be used in a variety or projects including scrapbooking, card making, keyrings and fridge magnets etc. Carefully reproduced & digitally enhanced by CDHM artisan. Dollhouse miniature size. ALL MINIATURE DOLL HOUSE SIZE. perfect for your miniature scene. photo shows miniature cards displayed next to a quarter coin (not included). Carefully reproduced & digitally enhanced by CDHM artisan. Dollhouse miniature size. ALL MINIATURE DOLL HOUSE SIZE. perfect for your miniature scene. photo shows miniature cards displayed on a 1/12 fireplace (not included). 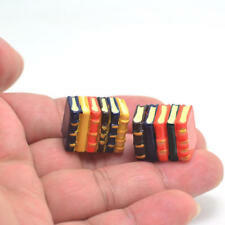 Special designed mini toy book blocks set for 1:12 dollhouse. Applicable for: 1:12 dollhouse. Six book blocks ( L x W x H) : Approx. Five book blocks (L x W x H) : Approx. Keep it dry and cool, avoid sunning. 3 x Cigarette Cases. 1/6 Scale Newspaper Maga. 1 x Laptop (paper model). 1 x Newspaper model. 1 x Magazine. Size :1: 6 scale. 1 x Military Map. 1 x Target Paper. Carefully reproduced & digitally enhanced by CDHM artisan. photo shows miniature cards displayed next to a quarter coin (not included). Dollhouse miniature size. ALL MINIATURE DOLL HOUSE SIZE. perfect for your miniature scene. Every dollhouse needs a few good books for those shelves. Perfect set to include 12 books with pages ~ they are blank. hesitate to reach out to us and ask. DONALD TRUMP MAGAZINES - SET of 3 Magazine Issues. Great for added realism to your display, shadow box, dollhouse or diorama! These magazines have interior pages, but they are blank. They are Printed on high quality paper with high definition for bright colors and excellent detail. 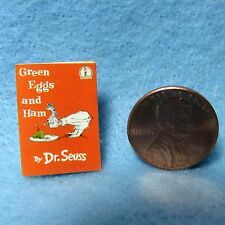 Dollhouse miniature book. Handbook for the Recently Deceased. Beetlejuice book. 1.16 scale. great color and detail. Book has Pages. Bible or Hymnal. Pages are real and blank. Christmas Cookbooks. Covers are printed with foil and great details. Pages are blank. A Christmas Carol. Replica item ~ perfect for any side table or bookcase. Dollhouse Miniature Color Palette And Two Brush tools. Applicable for: 1/12 Miniature Dollhouse. Material: wood. Care Instruction: Keep it dry and cool, avoid sunning. 5~9 20% off at least. Over 10 30% off at least. Applicable for: 1:12 dollhouse. Yellow book ( L x W x H) :Approx. Keep it dry and cool, avoid sunning. Size: shown on the picture. (Compatible With: Fit for Dollhouse laboratory, barbie house laboratory. 1 x Wood Rack. Test Tube Size: approx. Material: Wood & Glass. Color: Wood Color & Clear. Scale: 1:12. 2) Color may vary slightly due to the color setting of each individual monitor. DEADPOOL on the Covers. Great for added realism to your display, shadow box, dollhouse or diorama! These magazines have interior pages, but they are blank. They are Printed on high quality paper with high definition for bright colors and excellent detail. FARRAH FAWCETT Covers. 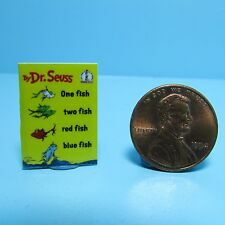 Great for added realism to your display, shadow box, dollhouse or diorama! These magazines have interior pages, but they are blank. They are Printed on high quality paper with high definition for bright colors and excellent detail. Complete Guide to Witchcraft Covenants & Etiquette. Covenants & Etiquette. Witchcraft Spells. Dollhouse size 1:12 scale. ALL MINIATURE DOLL HOUSE SIZE. perfect for your miniature scene. 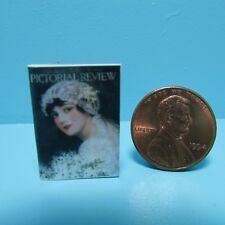 one miniature booklet - full colored glossy front & back pages - opening with blank pages. Size: Length 9cm 13"1/2. material: Paper. Wonderful treasure to add to your dollhouse! Does lay flat. Dollhouse miniature size. ALL MINIATURE DOLL HOUSE SIZE. photo shows miniature cards displayed next to a quarter coin (not included). perfect for your miniature scene. miniature dolls house size. These cards will look wonderful in your miniature scene or alternatively may be used in a variety or projects including scrapbooking, card making, keyrings and fridge magnets etc. 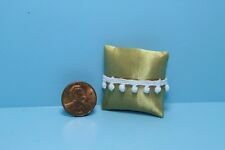 Dollhouse Miniature ~ 1:12 Scale ~ Fairy Garden Accessories. Atlas of Dragon Lairs. Set of 5 Wizard Reference Books ~ NEW. Doing that is against U.S. and international laws. Color of covers varies from that shown in photo (all will be orange, olive brown and black; just not necessarily on books as shown). Dollhouse Miniatures. 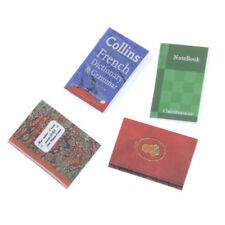 Product 1:12 Miniature Paper Notebook Diary Books Dictionary Set. 1/6 Scale Dollhouse. Display Case Box. Keep it dry and cool, avoid sunning. Small Size. Product View. We will reply you ASAP. 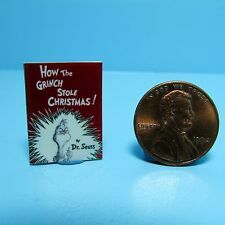 Perfect book set for your dollhouse. Printed covers. Blank pages. Golf Digest Magazine. Replica item ~ perfect for any coffee or side table. Carefully reproduced & digitally enhanced by CDHM & IGMA artisan. Dollhouse miniature size. ALL MINIATURE DOLL HOUSE SIZE. perfect for your miniature scene. miniature dolls house size. photo shows miniature cards displayed next to a quarter coin (not included). Dollshouse miniature book of Beatrix Potters "Peter Rabbit". The book is sewn and hand bound into a full colour cover with unique end papers. Perfect on the coffee table doll house box of rooms or a shelf in your Mini Scene. Color: colorful. Dollhouse miniature size. ALL MINIATURE DOLL HOUSE SIZE. miniature dolls house size. perfect for your miniature scene. photo shows miniature cards displayed next to a quarter coin (not included). 1:12 SCALE. Great set of faux books for your book shelves. Faux Books. hesitate to reach out to us and ask. Dollhouse Miniatures. 1/6 Scale Dollhouse. Bath Appliance. Small Size. Display Case Box. Product View. We will reply you ASAP. Garden & Outdoor. Dollhouse miniature size. ALL MINIATURE DOLL HOUSE SIZE. photo shows miniature cards displayed next to a quarter coin (not included). miniature dolls house size. perfect for your miniature scene. These cards will look wonderful in your miniature scene or alternatively may be used in a variety or projects including scrapbooking, card making, keyrings and fridge magnets etc. Creating velvet. tambour beading. Skills include. 'Elvis"The King is Dead'. 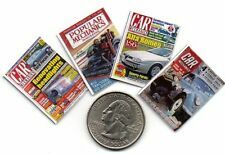 These newspapers will look wonderful in your miniature scene or alternatively may be used in a variety or projects including scrapbooking, card making, keyrings and fridge magnets etc.